Torquepower’s values are all about Respect for our customers, staff and suppliers; Quality in all that we do; Capability, Professionalism, and Enthusiasm, where every community member contributes and has a personal commitment to our success. We are proud to sponsor this squad of fine young men from Trinity College Rugby, Beenleigh – who week on week demonstrate these same values. Pictured here at Sunnybank Rugby Union grounds with Torquepower General Manager Andrew Lawrence. 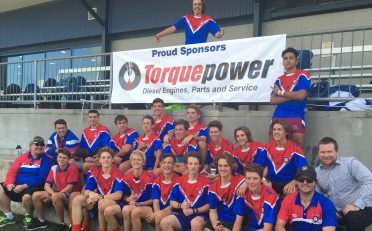 Torquepower has been part of the local community since 1978, and values great young people. Update : TRINITY COLLEGE, our young footy stars, have been battling 20 top teams in the Confraternity Cup at Padua College, and made their way into the quarter finals yesterday with a gritty 12-6 win against a Townsville team. They’ve been playing some pretty tough games but haven’t allowed themselves to be blown off the field. Some teams have had massive losses but Trinity College have represented themselves well, their best performance ironically, a 6/4 loss. Their coach Steve Czapracki said “ If the boys turn up with the same level of intensity tomorrow, they will go extremely well. “ WE LOVE THEIR ENERGY ! TORQUEPOWER for Cummins – Working hard for you – the better we buy, the less you pay !